Pete didn’t raise his voice but still managed to upset her. Why? How does Pete handle conflict? Although Pete becomes rigid and may lack tact like Jeffrey, he is less aggressive. 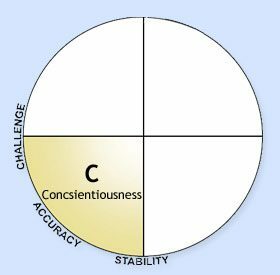 The C profile feels very uncomfortable with emotions, so they tend to remove themselves when emotional colleagues are present. If they feel bombarded, they stick straight to the facts and can easily overwhelm others with data. How does this affect other styles? Pete’s critical nature may come off as severe or rigid to his co-workers. While his words may not be offensive, his tone can upset others. Since the C style may not appreciate others’ feelings, their co-workers may feel they are insensitive or cynical. The C style is also known for removing themselves during discussions, which can lead co-workers to believe that they are uninterested in engaging with them. What can Pete do to improve? Pete’s strong attention to detail and efficient way of doing this can certainly help any idea get off the ground, but to be more efficient, they need to be seen by others as a team player. The C style needs to look beyond data and appreciate others’ differences. They should acknowledge their co-workers’ feelings and try to cooperate with others on a regular basis. While data is very important, Pete should also pay attention to his co-workers’ needs and show flexibility. It’s important to note that each individual style has its strengths and weaknesses. Working well with others is not about compromising who you are, but rather adapting yourself to others around you. This blog series was developed using the Everything DiSC Workplace, a customizable DiSC training program focused on teambuilding and effective communication. Don’t worry. DiSC profiles are very easy to use and the Everything DiSC Workplace Facilitator Kit is just as simple! You do NOT need to be DiSC certified in order to conduct the training. The facilitator kit provides you with everything you need to conduct a comprehensive training, right out the box. While you have the freedom to customize it, no additional work is necessary! Additional supplemental reports like Comparison Reports and Supplement for Facilitators Reports are free with EPIC accounts and can help you learn even more about your group and how they work together. Looking for more information? Contact us today! 1-888-658-6411 or email us at learn@corexcel.com. View our products on LinkedIn!